Submitted by Denis on Saturday, August 13th, 2016 at 2:31 pm. 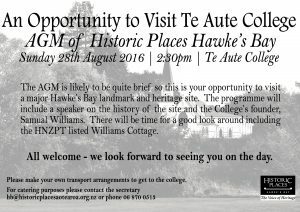 You have driven past many times, now you have the opportunity to visit Te Aute College. Details are set out in the flyer below. 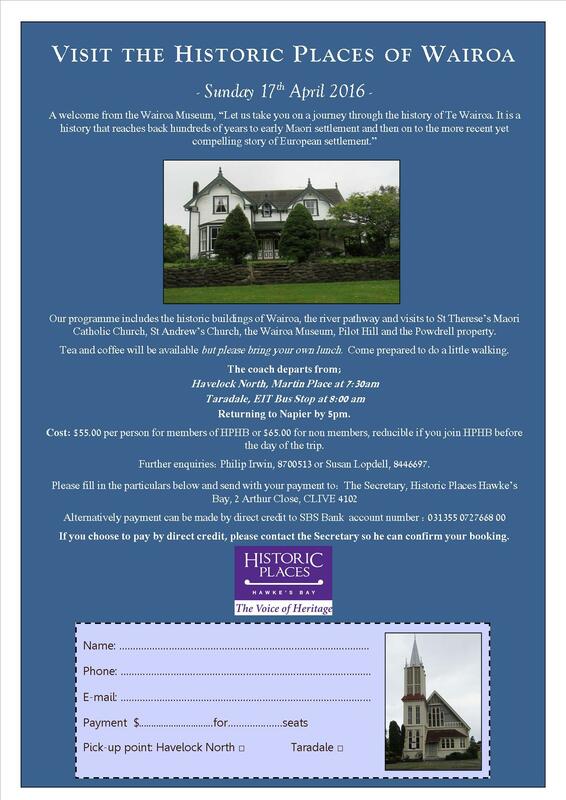 We look forward to seeing you on Sunday 28th August. Submitted by mark on Sunday, July 10th, 2016 at 4:03 pm. Submitted by Denis on Sunday, May 22nd, 2016 at 2:18 pm. 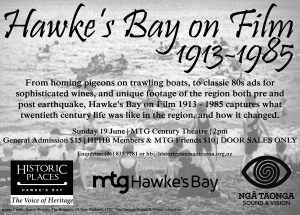 Historic Places Hawke's Bay, MTG and Nga Taonga Sound & Vision are putting on a film show at the Century Theatre in Napier on Sunday 19th June 2016. the programme includes a variety of items from the 20th century history of Hawke's Bay. the running time is 70 minutes. Submitted by Denis on Wednesday, May 18th, 2016 at 6:39 pm. Submitted by Denis on Wednesday, April 6th, 2016 at 7:10 pm. Submitted by Denis on Wednesday, March 9th, 2016 at 7:07 pm. Submitted by Denis on Monday, December 28th, 2015 at 2:07 pm. Submitted by mark on Friday, November 27th, 2015 at 12:55 pm. 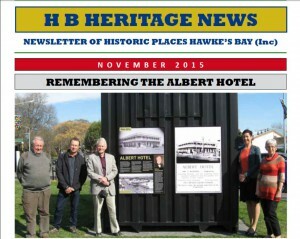 $45 per person for non members (or $35.00 if you join HPHB on the day). A remarkable New Zealander, a remarkable legacy. William Herbert Guthrie Smith died on the 4th July 1940 and is buried at Tutira. He left the 2000 acres that remained of the station in trust to the New Zealand public as an educational and recreational reserve. Spread over 90 hectares in rolling Hawke’s Bay hill country and overlooking the picturesque Lake Tutira, is the Guthrie Smith Arboretum. 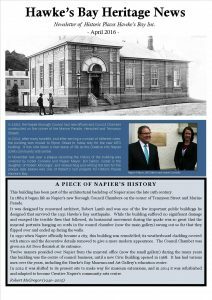 The afternoon’s programme will involve a talk by one of the Trustees, visiting the Homestead garden, the 1950 Tutira Church, “the Hangar”, providing an interesting backdrop of bush to the homestead, and time to wander over some of the trails. Submitted by EShipp on Wednesday, August 19th, 2015 at 9:19 pm. 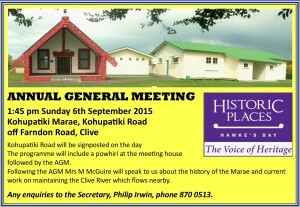 The Historic Places Hawke's Bay Annual General Meeting will be held at Kohupatiki Marae, Kohupatiki Road (off Farndon Road), Clive on Sunday September 6th 2015 at 1.45pm. 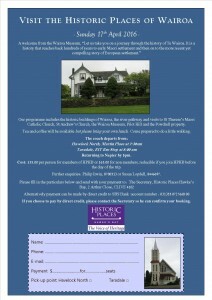 Any enquiries to the Secretary, Philip Irwin, phone 870 0513. Submitted by EShipp on Monday, June 22nd, 2015 at 10:28 pm.